Whenever we can, we try to offer a look at some creative new activations popping up around the city. When a solar paneled house pops up in the middle of one of New York's busiest intersections, people notice. 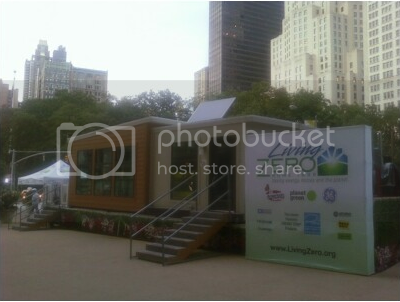 So it was, that yesterday we came across a traveling "net-zero energy home that is part of the Living Zero Home Tour which made Flatiron plaza stop five of a 16-city nationwide tour that will visit events and high traffic metro areas. The Tour is inviting visitors into the house to learn about energy efficiency and renewable energy with the tagline "saving energy, money and the planet...one House at a Time!" Tour sponsors include All American Homes, Planet Green, General Electric, Engenuity Systems, State Water Heaters, Wynham Hotels, Insignia Electronics by Best Buy and Georgia Power. Many of the sponsors products are featured inside the house, itself. With so many companies cause marketing green these days, it's important to break the mold with an activation platform that separates from the noise. Judging from the traffic yesterday, the Living Zero Tour seems to be off to a good start. It probably didn't hurt that the temperature was pushing 100, but I guess that's part of the message. 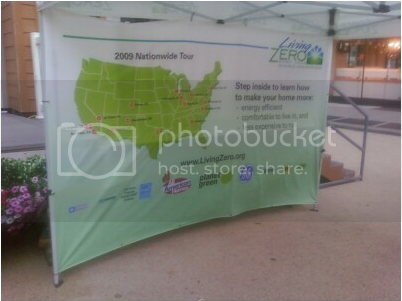 Living Zero offers a cool refuge ... with a purpose. Clever.